Robert Vaughn, Nyree Dawn Porter and Tony Anholt star as Harry Rule, Contessa di Contini and Paul Buchet in Gerry Anderson's first and only contemporary, jet-setting high kicking thriller series. 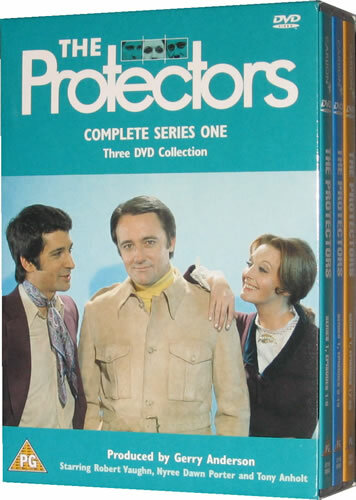 A lone wolf in London, a beatiful British aristocrat abroad and a suave Parisian specialising in gadgetry come together as three intrepid international private detectives whose services come at the highest price. 2000 Feet to Die: A friend of Harry's insists on doing a dangerous skydiving trick despite the fact that gold smugglers are trying to kill him. Brother Hood: A wealthy recluse hires the Protectors to break his brother out of prison. See No Evil: While in Rome the Protectors try to help a senator who is being blackmailed. Disappearing Trick: The Contessa ends up putting her life in danger when she agrees to help an old friend win a wager by making him disappear. Ceremony For the Dead: The wife of a president hires the Protectors to guard her critically ill husband whom she fears may be kidnapped. It Was All Over Leipzig: While investigating a plot to overthrow the government of a Mediterranean nation the Protectors end up confronting two old friends of the Contessa, one whom with she was romantically involved with. The Quick Brown Fox: The West German government hires the Protectors to put a pension fund that is supporting fugitive Nazi's out of business. 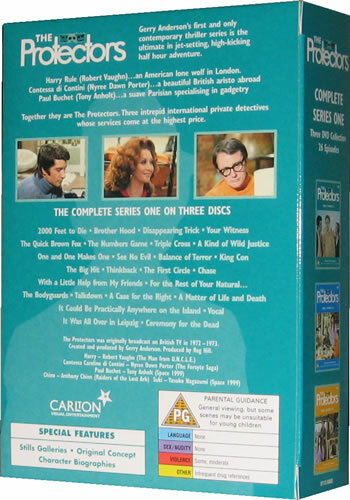 King Con: The Protectors devise an elaborate con to recover a priceless antique which a woman had been conned out of. Thinkback: Harry and the Contessa are the victims of a car crash that was engineered to get information out of them. A Kind of Wild Justice: The daughter of a gangster whom Harry helped put in prison fails twice in her efforts to kill Harry. Balance of Terror: The KGB hires the Protectors to capture a renegade Russian scientist who plans on destroying London with a new virus to show the world how dangerous biological warfare can be. Triple Cross: A kidnapped Paul will be blown to bits unless Harry and the Contessa help steal jewels which they have been hired to safeguard. The Numbers Game: The Protectors only hope of putting a drug smuggling ring out of business lies in being able to decode a coded letter. For the Rest of Your Natural...: The Contessa is captured by a psychotic killer who puts her on trial for her life. The Bodyguards: The police hire the Protectors to guard the corpse of a bank robber as part of a ruse to capture his accomplices. A Matter of Life and Death: In Malta, with only the body of a dead hippie as a clue, the Protectors go after smugglers despite having no idea what it is that is being smuggled. The Big Hit: After unsuccessful attempts on their lives, Paul and the Contessa are too late to warn Harry that someone is out to kill him. One and One Makes One: The Protectors are hired to rescue a captured Canadian agent before he breaks, unaware that he is really an enemy agent impostor. Talkdown: Harry must land a small plane on his own when the pilot dies. Vocal: Drug dealers plan on using someone who can impersonate Harry's voice in order to get information out of a blinded Paul. With a Little Help From My Friends: Harry finds his family being threatened after he agrees to guard a visiting president in London. Chase: The Contessa gives Harry a shotgun for his birthday which he soon puts to good use when while investigating political blackmail he becomes the quarry in a manhunt. Your Witness: An important witness to a murder who doesn't want the Protectors protection, vanishes soon after she is placed in the Protectors charge. It Could Be Practically Anywhere on the Island: A poodle that has swallowed a valuable diamond is kidnapped. The First Circle: Harry is hired to protect a disturbed Vietnam war veteran. A Case For the Right: The Protectors end up in trouble in the Roman tombs.